Building relationships with you on a foundation of trust, communication, and results makes Smithereen your expert, consultant, and partner. As a 4th generation owned company, Smithereen understands what really matters to our clients: time, safety, and security. Smithereen's inspections are timely and effective. Service was great an professionally. Always available anytime I call or text! The only pest control company we use on all of our properties! Oleg is always available and very helpful! Fast, reliable, affordable, and effective, Smithereens offers great service. Most knowledgeable specialist I’ve had to my home. I am confident we are in good hands. I just want to thank Ronnie for the great job he done at my home he had to cover 3300 sf of space he did it with a smile you can tell the company trained him very well, i can get a good night rest now thanks to smithereen and ronnie. You arrived in time and sprayed all my house inside and out but, you sent me a yearly contract which to did not agree to, but I will keep. Smithereen is taking care of our rodent problem. Thank you Smithereen! we love Mark. He knows our old building better than we do. He has taken great care of us for years. I will need another application for spiders and ants. Thank you so much for being very fast to book appointments and the report you send if very helpful. Good service, on time, good job. Will keep card for future use??? (Hope not needed)!! Happy, and will recommend to everyone who has an interest, including my new home location of Kendallwood Apartments. Rated #10. So far Trent (?) has been great. On time, very helpful and accommodating with our needs. We really enjoy working with Jason, and appreciate Smithereen's help in general. 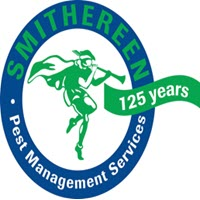 Smithereen Pest Mgmt Svcs is very responsive to all requests and building pest concerns. I have been happy with the service over the years. All pest issues are taken care of. Yes, I think your employees do a good job of spraying inside and outside to keep the bugs away. The monthly pest control is prompt and the technician is always friendly. If a situation rises and we need some expertise, they are the ones to call! Great Service!! You have a quality service and great team, from Lisa at reception to your service team. Jason, who has been to our home several times, is professional and knowledgeable. Very prompt on service and customer service is excellent. Takes care of the problems in a timely manner. I am always happy with Ronnie's service. great service! Always friendly and helpful! Representative is friendly. No rodent occurances in quite some time in my office. Have had a few ant incidents though. Need to say that Monty Lee, consistently does an amazing job. Thanks. We use Smithereen at the apartment complex I manage and our technician Trent is the man! Friendly, knowledgeable, and always willing to go the extra mile for our residents. Highly recommend! Awesome customer service! Matt is great.